This is safe to be used inside an AST node, in contrast with TemplateArgumentListInfo. Definition at line 603 of file TemplateBase.h. Definition at line 631 of file TemplateBase.h. Definition at line 564 of file TemplateBase.cpp. Referenced by clang::FunctionTemplateSpecializationInfo::Create(), and clang::ClassTemplatePartialSpecializationDecl::Create(). Definition at line 622 of file TemplateBase.h. Definition at line 629 of file TemplateBase.h. Definition at line 623 of file TemplateBase.h. Definition at line 626 of file TemplateBase.h. 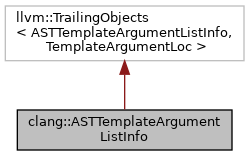 Referenced by clang::ASTRecordWriter::AddASTTemplateArgumentListInfo(), clang::TemplateDeclInstantiator::InstantiateClassTemplatePartialSpecialization(), and clang::TemplateDeclInstantiator::InstantiateVarTemplatePartialSpecialization(). Definition at line 635 of file TemplateBase.h. Definition at line 607 of file TemplateBase.h. The source location of the left angle bracket ('<'). Definition at line 614 of file TemplateBase.h. Referenced by clang::ASTRecordWriter::AddASTTemplateArgumentListInfo(), clang::TemplateDeclInstantiator::InstantiateClassTemplatePartialSpecialization(), clang::TemplateDeclInstantiator::InstantiateVarTemplatePartialSpecialization(), and clang::ASTDeclWriter::VisitFunctionDecl(). Definition at line 620 of file TemplateBase.h. The source location of the right angle bracket ('>'). Definition at line 617 of file TemplateBase.h.